My very first styled shoot was featured on Burnett's Boards last week, so I am so excited to be able to finally share this here on my own blog! Planning a styled shoot has long been a goal of mine. I wrote it down at the beginning of 2016 in a journal full of ambitions and goals and prayed a bit about it. I'm not a planner by any means, there is definitely a reason I'm a photographer and not a wedding planner, so I was a bit worried none of this would come together whatsoever. But, the Lord always finds a way, and I met two of the most inspiring people last year that would help my little dream become a reality. I met Kali Measures of Kindle & Gather, who is the styling genius behind this shoot, through a client we were both working with for their wedding during the first half of the year. I quickly realized on the wedding day how much I enjoyed being in her company and working with her, so I told myself I'd have to contact her soon to see if she'd be interested in doing a collaboration. Fast forward a few months, I emailed her my ideas for this moody and romantic shoot, and she replied with a yes, of course! I don’t think I could have managed without her. Shelby, the model in this inspiration, was also a source of encouragement and her constant drive gave me the courage to really get the planning process of this shoot going. So it was pretty natural for me to ask her to be the bride! When finding inspiration, I thought back to the tones that I've always been naturally drawn to. Deep blues, burgundies, and dark wood tones are some of my favorite and it was easy to be inspired by the mood Carrington Crossing brought to our shoot. Located in Downtown Buda, just a few minutes outside of Austin, this antique store turned wedding venue gives you some of that old world Texas charm. The upstairs rooms had some of the most beautiful natural light, and the abundance of different textures was so incredible. From an ivy wall in the side yard to peeling paint and rich wooden floors, I knew it was the perfect location for this wedding shoot. 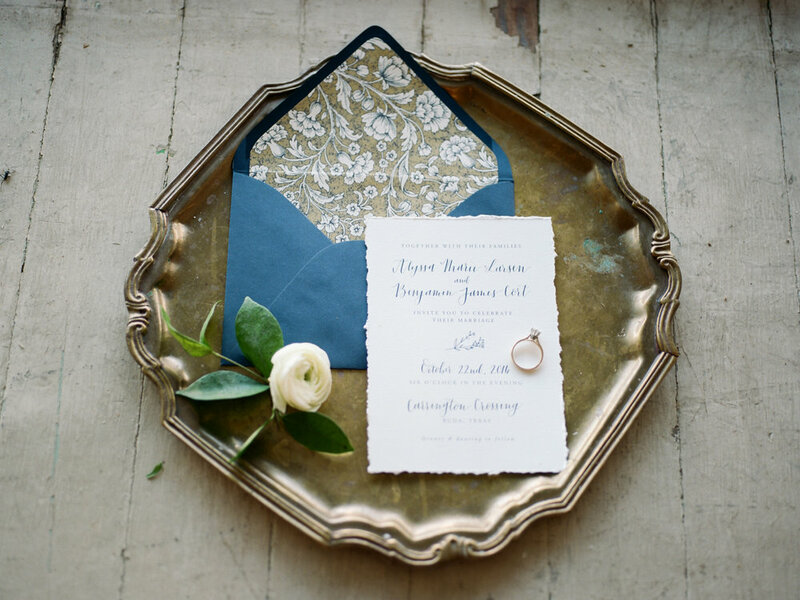 My original source of inspiration was from gold ink on navy blue paper, and Katelyn from August & Ember took that vision and created the most beautiful set of invitations, right down to the gorgeous envelope liner. Evan from The Green Room created the perfect bouquet full of dahlias, ranunculus, and wild leafy greens, that instantly reminded me of early winter here in Texas. The colors are perfect for an early winter wedding here in Texas, which I think is one of the most romantic times of the year. Unbridaled’s sleeved lace dress had a touch of romance and classic elegance, and the flow of the skirt was pretty much magic. I hope you guys enjoy this wedding inspiration! It was so much fun to plan and shoot, and I'm sooo thankful to all of the wonderful creatives that put their heart into this. You guys are rockstars.